GoFlo travelling water screens work effectively with the mesh bar-spacings from 2 mm to 50 mm, with any bar-spacing between these extremes available. The screen is also future-proof because the screen mesh belt can be easily changed to a different bar-spacing in the future if required. In addition to the mesh sizing, none of the other working parts of a GoFlo screen have a gap of greater than 2 mm, even while the screen is being removed for maintenance, so the tightest screening compliance can be maintained at all times. GoFlo screens are designed for long life and minimal maintenance. All of the metalwork is stainless steel to ensure no corrosion and the screen stays looking attractive for its whole life. The bearings are zero-maintenance self-lubricating polymer bearings and the motor / gearbox unit is a standard off-the-shelf item which available throughout the world. Everything has been designed, where possible for zero maintenance, and where maintenance is required the design is such that this can be done quickly and easily. The system is designed by people who work with water intake screens day in, day out, so we understand the frustrations with conventional designs and have overcome them to produce the ‘perfect’ water intake screening system. Most debris falls off the top of the screen into the flushing trough as the screen rotates, then any stubborn, sticky debris is removed by a high-pressure water jet. The debris falls into a flushing trough which has a pumped flow of water in it to carry the debris downstream where it is normally discharged back into the watercourse, downstream of the water intake. Removing inclined intake screens can be difficult because the centre of gravity is not below the above-water lifting points. The GoFlo system uses a patented ‘tilting base’ which allows the screen to be tilted to a vertical position and then simply slid in and out using a vertical lift. This saves an enormous amount of time and expense during any maintenance operations. The whole assembly uses integrated guide rails and a positive location system at the base so there is no time wasted aligning things and wondering if it is positioned properly underwater, and the whole operation can be completed with personnel working out of the water. There is even provision for inserting a blanking plate, so while the screen is / is being removed the maximum gap of 2 mm is still maintained for fish and eel screening and the main screening area is blanked off to prevent entry of any debris. This is particularly useful for multiple-screen installations because the downstream hydropower turbine / plant can be left running with negligible impact on performance. Once removed the screen electrics are disconnected using a simple quick-connect connector for all of the power and control system electrics. GoFlo screen cleaning cycles can be triggered based on the differential water level across the screen (this is the normal setting), or triggered at fixed time intervals, or manually triggered on site or remotely. The GoFlo controller is a full PLC-based control system connected to the internet for remote access and with a webcam watching the screen so you can see it from you desktop, anywhere in the world. The controller also logs key operating variables such as water differential and temperatures so you can see what has been happening over the last days and weeks, and it also logs motor current and other variables that can be used to trigger maintenance warnings in advance of failure so preventative steps can be taken. Intakes screens are no longer dumb pieces of electro-mechanical hardware; the GoFlo system can tell you what it has been doing and why, and what you should do in the future to improve performance! All of this functionality is available with full remote access and control. The system can be fully integrated into a remote SCADA system for industrial applications as an optional extra. 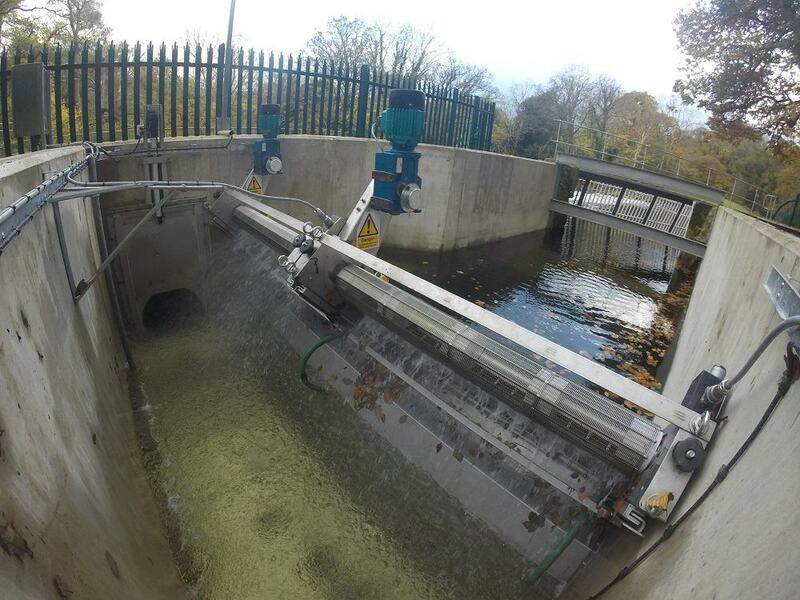 GoFlo travelling water screens can be installed as single units at smaller sites or multiple units for larger intakes. Multiple units can be butted-up against one another and still maintain the 2 mm maximum spacing required under the eel regulations. They can still be slid-in and out for maintenance without disturbing adjacent screens. Multiple-screens connect back to a single controller to save space in your plant room. For sites with particularly aggressive and corrosive water environments’, 316 and higher grade stainless steels are available. For normal fresh water applications the standard 304 stainless steel version is more than adequate. The standard GoFlo system uses a hydraulic motor and drive system which is rated for outdoor applications. Using hydraulic motors reduces the risk of electrical faults developing on the screens, reduces visual impact due to their smaller size in comparison to electric motors and results in quieter operation. Electric motor versions are also available in a variety of IP ratings depending on the application. The system is not designed for long-term operation with the motor and drive system submerged, though there may be options for achieving this in special situations – please contact us to discuss your requirements. GoFlo screens can be electroplated with a copper-zinc coating to significantly reduce biofouling in areas that have the invasive species Quagga and Zebra Mussels present. Copper-Nickel coatings are used extensively in the onshore and offshore marine environments to prevent biofouling from mussels. The coating is 100 microns (0.1 mm) thick and would be effective for several decades of operation. The whole screen, including the moving belt and fasteners are plated to maximise the resistance. The coating normally adds approximately 17.5 % increase to the screen cost due to the complexities of electroplating such large fabrications.